On Sunday, Gani and I went on our way to hear mass. Reese had a bad cold and cough so we didn’t bring her along. 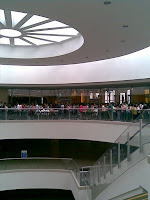 We usually attend mass inside the mall for convenience, accessibility and good ventilation. I must admit, I find it very difficult to keep my focus if I feel too warm. Having said that, I think it’s my job to seek for a good place to worship and make sure that I am not just physically present but also spiritually engaged during masses. So we went to Megamall yesterday and to our surpise, it was the first opening day of the new Chapel of the Eucharistic Lord, a very good thing about the mall's ongoing expansion. The place was very nice, brightly lit and felt so solemn. It has a so called “crying room” for kids in case they become unruly and also, a “cellphone blocker” so that stubborn adults could no longer use their mobile phones. These add-ons really helped make the mass celebration a solemn one. Fr. Mario was the presiding priest and shared the story to us about the owner of the structure who was currently in the hospital. I didn’t get her name, but whoever she is, she must be very wealthy and kind-hearted person. I hope and pray that she’ll get well soon. I admire her for sharing her blessings in a very God-ly way. If only all the wealthy people will do the same, there’ll be more nice churches built in the Philippines alone, and even worldwide. 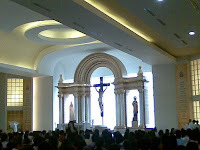 Another part of the homily that I really liked was about the existence of Catholic church/mass in malls. I completely agree with Fr. Mario when he said that, “If people ask me why there should be a mass inside malls, I turned back and say, why not? It only implies that in the midst of towering businesses, busy people and streets, God is everywhere and must be a consistent part of our daily lives.” That was a very beautiful message! I sometimes felt guilty of hearing masses inside malls. Although, I might have another agenda after mass, but I try to keep first things first most of the time. I worked on keeping my priorities straight, finding ways to connect with our loving God before anything else.